Use Zhuyin Fuhao to type Chinese characters? 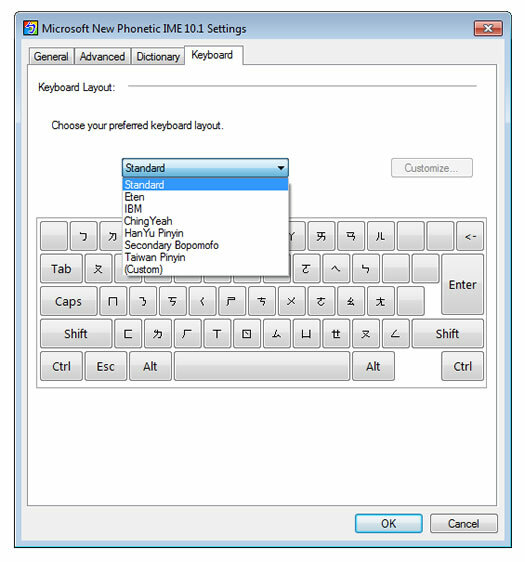 Use the "Standard Keyboard" in the Chinese (Taiwan) Microsoft New Phonetic 10.x input method editor (IME). Type only Zhuyin Fuhao, no hanzi? Use the Chinese (PRC) Zhuyin "software keyboard". Use the Chinese (Taiwan) Zhuyin input method. Add Zhuyin Fuhao next to Chinese characters? Use a Chinese ruby text font (recommended). 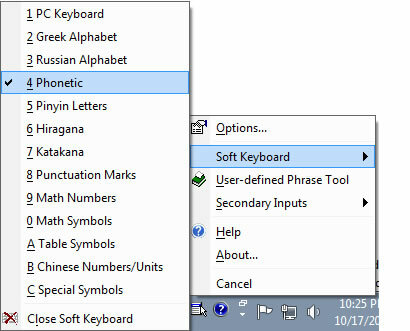 Use MS Word's "Phonetic Guide" (free if you own Word). The Zhuyin keyboard is available as part of the Chinese (Taiwan) Microsoft New Phonetic Traditional character input method. Setup is the same as my instructions for Pinyin Traditional input, except that you skip the last step of changing the keyboard to Pinyin. Zhuyin is the default keyboard for that IME. FAQ: "How do I get the "candidate list" to appear in Windows Taiwan (Traditional) IME?" FAQ: "The characters in the Windows Taiwan/Traditional candidate list are really tiny! Is there a way to adjust the size?" 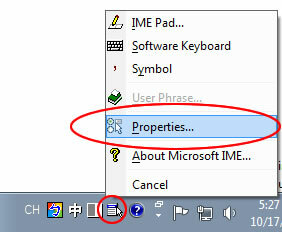 User Guide: The Microsoft New Phonetic IME Help Files. Believe it or not, the easiest way to just tap out a few "bo po mo" is to use the Zhuyin soft keyboard included with the PRC input methods! "Ruby text" is characters in a smaller type size placed above or alongside other characters. "Ruby" was originally the name for a small British font used for such annotations. In Chinese, this usually means adding little Zhuyin Fuhao or Hanyu Pinyin next to Chinese characters. You can try to type these separately and line everything up in your word processor or spreadsheet, but that never looks quite right and often takes forever so I have a couple of suggestions for you. Ruby layout can also be created in html using the <ruby> tag, but I am not going to get into that here. The following options are for the average user using the average word processor. A Chinese font specifically created for this purpose will offer each Chinese character with ruby annotations as one unit, taking up only the same amount of space as any other character. These fonts can be used just like any other font: just select it and start typing Chinese. If you already have Chinese text in another font, select it and then choose your ruby font from the menu. If a Chinese character has more than one pronunciation (poyin zi), select that character and choose an alternate version of the same font from the font menu to change the ruby characters. Notice that in the "Recently Used Fonts" section of the font menu above, there is a version of "DFP Biao Kai" with the word "PoIn" near the end of the font name. There are a total five of those poyin variants for each ruby font in this set. 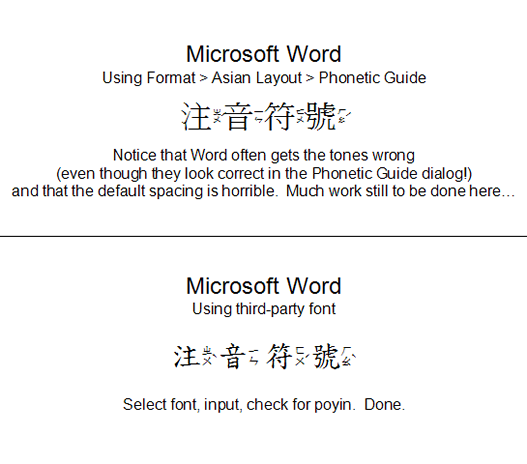 Option B - Use MS Word's "Phonetic Guide"
I hate this one, especially when trying to place Zhuyin ruby characters at the side of Hanzi as is the Taiwan education standard. It's not so bad when you put them on top, but overall I find this feature very frustrating for our current purpose. Unlike the font option described above, with Phonetic Guide you are limited to selecting only a one to three sentences at a time. But my main frustration with this feature is how the results look. The first time attempting to use the Phonetic Guide, most people will find themselves bringing up the dialog box again and again just to add and adjust their ruby characters. As in the above example, their tone marks can get all scrambled up when moving the Zhuyin from above to alongside the hanzi as in the above example. The spacing between characters looks crowded compared to a specially designed font. I could go on. Eventually you figure out more about how to tweak this. But basically Word's Phonetic Guide is a very slow, cumbersome, unattractive way to create ruby characters. Of course if you already have Word, this is free. Free is good. And if all the extra time you will spend with this is worth less to you (or your boss) than buying an inexpensive font or two, go ahead. Why your Phonetic Guide is not automatically producing Pinyin or Zhuyin, and how to fix it. Alternatives to all of the above include free online tools that annotate your characters with Pinyin and/or translation in multi-line simulations of ruby text. I try to keep a current list of these tools on my Third Party Apps page.